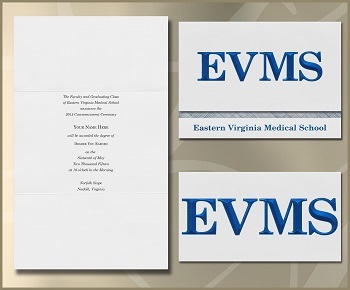 By March, all graduating students will receive a complimentary HTML invitation email (sent to your EVMS email account) that you may forward on to family and friends to notify them of EVMS' Commencement for the Class of 2019. Should you prefer formal, printed announcements and related items, below are instructions for ordering them through our vendor, Signature Announcements. While Signature Announcements has no specific deadline for ordering, you will need to allow enough time before the ceremony to receive your announcements and to send them out two weeks prior or up to two weeks after the event. Additionally, Signature Announcements offers packages that also include diploma frames and other graduation memorabilia. Class rings are also available through this vendor. Signature Announcements' standard order-processing time is approximately two to three weeks. If you are using the announcements as invitations, you should allow additional time when mailing out of the state/country and for those people you will be inviting to the ceremony. Online: To order online, please visit the ordering web page and fill out all the required information. Ensure that your name is spelled correctly and your information reads exactly the way you want it to. Signature Announcements accepts payment via American Express, Discover, VISA, Mastercard, and personal checks. You may submit your order and pay later. Phone Orders: Professional Representatives are available to take your order over the phone at 888.830.8305. They will verify your information and email you a proof of your order text. Please read the back of your order form to review package items. Please note that all items in red on the order form are for online orders only. Standard shipping takes approximately two to three weeks. There is no guaranteed delivery date, but you may order a "rush" to guarantee faster delivery.